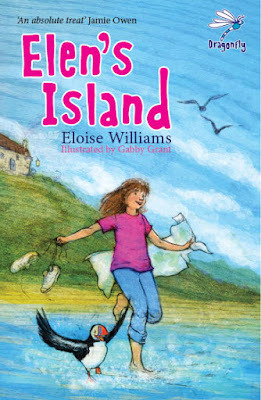 Eloise William's middle grade debut is the story of a feisty girl called Elen. When her parents decide to jet off on holiday without her, she is packed off to spend the summer with a granny she's never met, on a small Welsh island called Aberglad. Understandably, Elen feels betrayed and is determined to make her summer as miserable as possible, both for her granny and for herself. But the island soon starts weaving its summery magic spell on her and before long she is pitched headlong into an adventure involving a treasure hunt, secret caves and skeletons in the family cupboard. When I started the book I had no idea whether Aberglad is a real island or the product of the author's imagination. I resisted the tempation to google before I finished the story. Williams conjures up such a magical, enchanting idyll I did not want to see the real island, if there was one. It might not live up to its wild beauty on the printed page. Thankfully there isn't. Aberglad is safe for ever from ruthless developers within the pages of the book, and in readers' imagination. It reminds me a bit of Kirrin Island in the Famous Five Books. Not that this book is anything like Blyton. True, it's primarily a rollicking adventure with some exciting set-pieces, and a delightful summer read, but it's also an insightful tale about growing up and finding yourself. About learning to recognise what is truly precious. The characters, including Gran, her eccentric friends and the two main characters - Elen and her puffin-taming friend Rowan - are sharply drawn. Gaby Grant's line drawings are delightful. This is a first rate book I shall be giving out for Christmas and birthdays. Eloise Williams is a writer to watch. Saviour's latest book, THE GHOSTS WHO DANCED - SPOOKY STORIES FROM AROUND THE WORLD is out now.